There's absolutely no reason Golduck should be this high, but I really like it. It was the first Pokemon I ever got to Level 100, so it's definitely got that nostalgic factor for me. I'm also a big fan of its battle cry in Pokemon Stadium, and that red dot in its forehead is so sharp. Statwise, Golduck is absolutely average all across the board. I guess it's good that it doesn't have any major weaknesses, but it also doesn't have any major strengths, so it's all a wash. Looking at it now, the face kinda looks like that pun dog meme, which makes me like Goldy even more. The best moveset for Golduck involves a little Pokemon Stadium trickery. I believe you need to get all 151 Pokemon into the Hall of Fame, and then you can teach your Psyduck (who you will then evolve into Golduck) the move Amnesia. In Generation I, it sharply raises your Special stat, which is absurdly broken. Pair it with three Special moves and you're doing aight. 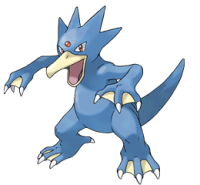 Surf is the way to go to get STAB, and even though it's the weakest Psychic move, Golduck can learn Confusion, which is useful against Poison and Fighting types, plus you have a chance of confusing your opponent. And let me tell you, NOTHING is more satisfying than watching your opponent attack themselves. For the final move, Blizzard is always a good choice. Golduck's two weaknesses are Electric and Grass, and Blizzard will take out Grass-types. If you want, you can substitute Dig for Confusion to have the chance to take out 'lectric-types. It's your Golduck, so do whatever your little heart desires. Squawk on.